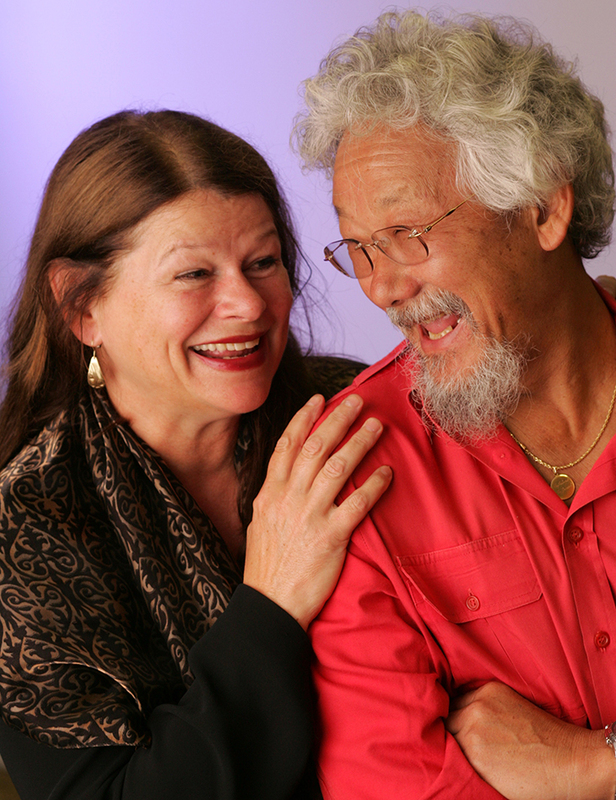 Canadian professor, science educator, environmental activist and new octogenarian senior citizen David Suzuki and his twin sister Marcia were born on March 24, 1936 in Vancouver, British Columbia. Because they were Japanese-Canadian, during World War II David and the Suzuki family were sent to a Japanese internment camp and their family business was sold. When the war ended they were forced to move east, first to Leamington, Ontario and then settling in London, Ontario. David Suzuki married high school girlfriend Setsuko Sunahara in 1958, and their three children Tamiko (b. 1960), Troy (b.1962), and Laura (b. 1964) were born before the Suzuki's divorced in 1965. Suzuki earned a BA in Biology and a PhD in Zoology, and worked as a professor in genetics at U.B.C. (University of British Columbia) from 1963 until he retired in 2001. Suzuki first came on to the nation's television screens with Suzuki on Science (1970-1972), a children's show. Below, a young David Suzuki talked on CBC in 1972 about stereotyping, racism, and the role geneticism. From 1975-1979 Suzuki hosted the weekly science news radio program on CBC Quirks & Quarks, as well as Science Magazine (1975-1979), a half-hour weekly television show aimed at adults hosted by David Suzuki. In 1979, Suzuki took over hosting duties for the CBC television documentary series The Nature of Things, which is still airing today. 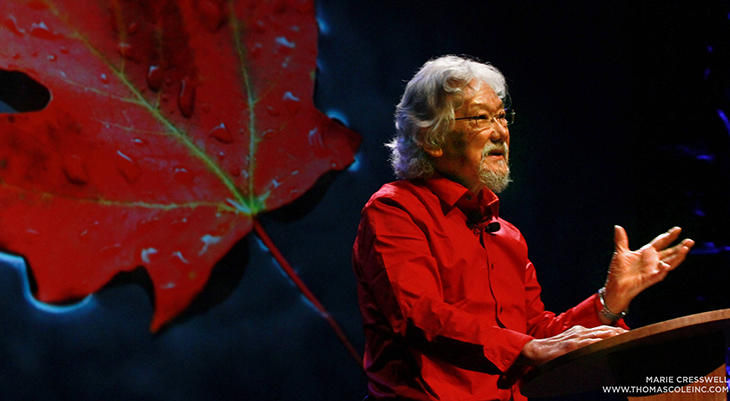 Below, host David Suzuki was featured in a CBC The Nature of Things 50th anniversary clip in 2010. 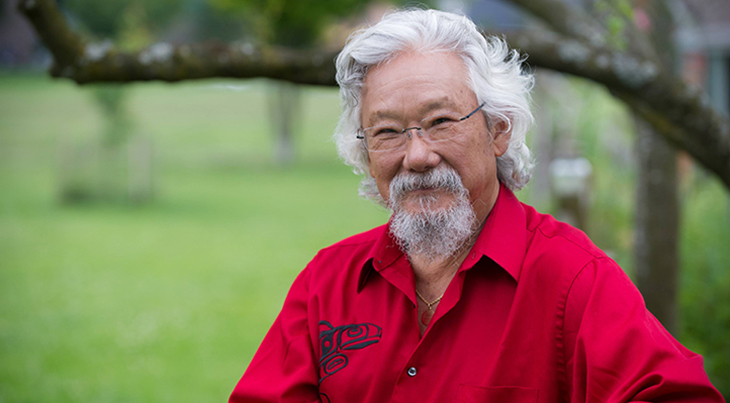 In between these duties, David Suzuki has hosted other television series for the Discovery Channel, PBS, and other organizations. Suzuki's passionate support of conservation, environmentalism and activism around climate change has made him a household name around the world. In David Suzuki: The Autobiography (2006), Suzuki says he met Tara Cullis at a 1971 Carleton University lecture in Ottawa, Ontario; he was 35, she was 22. Tara Cullis and David Suzuki were married in 1973 and were joined by their daughters Severn (b. 1979) and Sarika (b.1984). David Suzuki's mother Setsu Nakamura, her sister and two of her brothers died from Alzheimer's Disease. Septuagenarian senior citizen Suzuki focused on Alzheimer's Disease during a special episode of The Nature of Things in 2013. "At my age the best medicine (77) is exercise. I try to get to the gym and work out. You look at things like Alzheimer's, diabetes, stroke, heart disease - the most effective thing at reducing your risk is exercise...We're in for a tidal wave of Alzheimer's as the population ages. We should be looking at all the ways we can keep people with the problem integrated with society as long as we can". Suzuki has written 19 children's books and over 30 books for adults, exploring his interests and passions - science, conservation, environmentalism, biology, genetics, climate change, and more. Along his life's journey David Suzuki had garnered many accolades and holds over 25 honorary degrees from almost every major university and province in Canada, including such prestigious Ontario universities as McMaster (Hamilton), Carleton (Ottawa), Guelph, York (Toronto), UWO (London), and Queen's (Kingston). Simon Fraser and UBC in his native British Columbia, three universities in Quebec, and universities in the provinces of Alberta, PEI, and Nova Scotia, have all conferred honorary degrees. Several universities in the United States, Australia, and the United Kingdom have also honored Suzuki with degrees. Today, although David Suzuki retired from his life in academia in 2001, he shows no signs of retiring from his activism. He still hosts The Nature of Things and other documentaries, and is a proud grandfather.